I have a new painting in a show that opens this Friday, November 16, at the the West End Gallery. The name of the show is “Masterpieces: A Collection of Kick*** Artwork” and it focuses on the process of the artist behind each piece. There are photos, studies and writings that document how each piece came to be. From the work I have seen from the show thus far, it lives up to its name. My contribution to the show is 48″ high by 24″ wide painting on canvas that I am calling And the Glimmer Comes... It is shown here on the right. I decided for this show to do the painting for this show using studies and drawings, something I almost never use. Normally, I start with a surface that is prepared with multiple layers of gesso and, more often than not recently, a top layer of black paint. Then I just begin with a block of color, usually the red oxide that I use for composing my underpainting and usually in the lower half of the composition. Then I let the painting grow organically, the first block of color guiding me to the second and the second to the third and so on. After the piece is fully composed this way, I build out the colors from darker to lighter tones. In the very simplest terms, that is my normal process. But for this piece I decided to go with two studies. 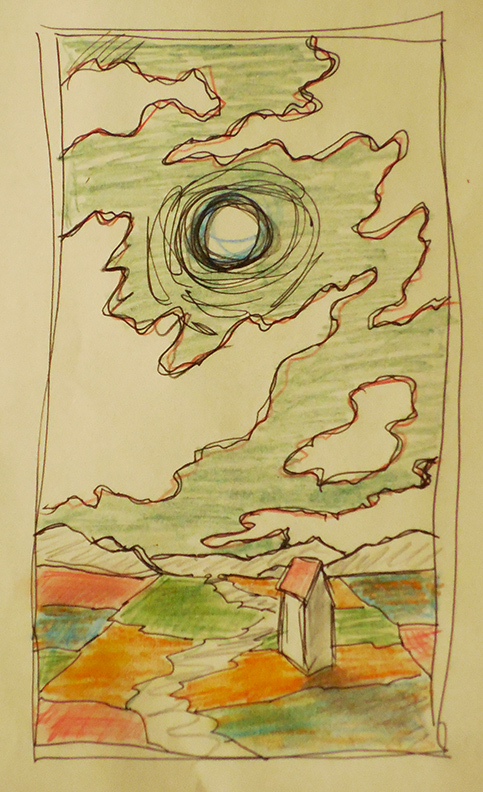 The first would be a rough sketch that would set out the basic composition of the painting. When I say rough, I mean rough, as you can see. I take only a minute or so to create it as I am only looking for a basic silhouette, a blocked out map to follow with little detail or nuance. It is not meant to be anything on its own, just a bit of shorthand to guide me in the next step. The next step is the creation of a study, a smaller (24″ by 12″) version of the final larger painting. I followed the sketch with my underpainting and it was pretty much in line. But I have a small problem in making studies which are usually more loosely painted than the final version. My problem is that once I begin painting I treat that piece as a final version. I have spent many years treating every piece I paint as nothing less than a complete painting unto itself, something that is not less or subservient to any other painting in my body of work. Once I started working on this “study” I couldn’t help but continue smoothing off the piece, making it whole. It was not a study at all as it quickly evolved into an autonomous painting with its own voice, its own life. I am showing it as such with the title Lightbreak. My next step was to transfer this image to the larger canvas. My first move was to block in the house much as it was in the sketch and the smaller version, although I did add an addition and another small roof to it. 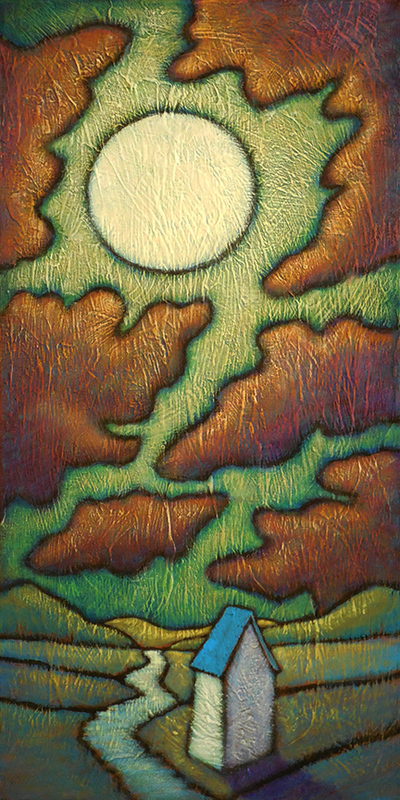 At this point I could see new potentials in the open space of the larger canvas as well in the unique texture it possessed. It just begged for and explicitly pointed me to something different from the other pieces. I immediately changed the composition to add a couple of rolling knolls leading a body of water that would extend to a horizon between two tongues of land that would jut in from either side. It began to speak in its own voice at once and was telling me how to proceed with the sky. 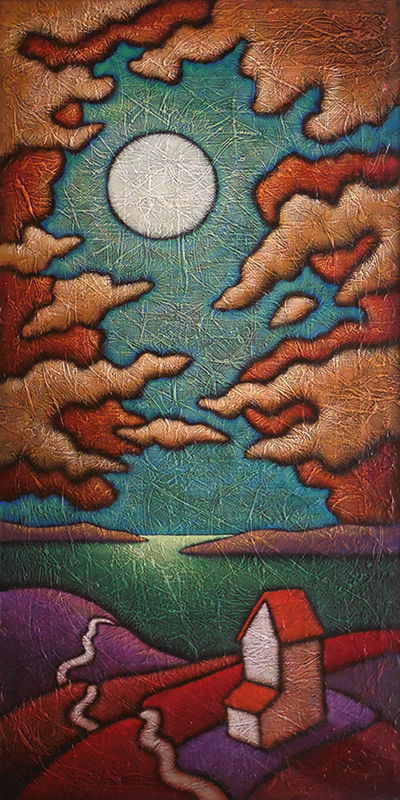 The larger surface created more open space so I opted for an additional underlying layer of clouds that would have a darker tone to contrast with those in the forefront. Doing so created an interestingly shaped negative space comprised of the blue-green color of the sky in its middle, That form became a structural element in this piece. Building out the colors brought changes as well. The piece of land in the forefront were richer in color and more vibrant, mainly because I felt that the larger space it occupied required a bolder and more pronounced treatment. It acts as a strong foundation in this painting. The final touches come in creating the glimmer at the horizon. That simple step made the whole of the painting gather together, creating a wonderful geometry between the various elements of the painting. It felt to me like the high note of climax in a dramatic aria. That is a very condensed version of how the final painting came to be. Whether it lives up to the title of the show is not for me to say. The most I can say is that I feel this painting fits well among what I consider my better work. So maybe in that aspect it lives up to the show’s title. Come out to the West End Gallery and see for yourself.